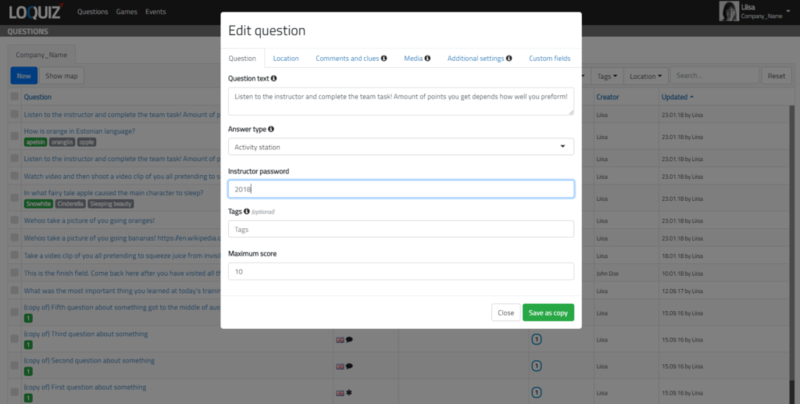 Loquiz has had so far 7 question types to put your content into. Now make it 8 because the newest question type, an Activity station has arrived! As many games have the focus on real-life interactions then one of the most anticipated new question types has been the Activity station. 1) It allows the instructor on spot to give a different amount of points to the teams according to their performance. 2) It opens up the question and displays it like any other type of questions does. But it allows also to close the question/task and for the team to return later to complete it. It is handy when there is a queue at the instructor spot. Then the team can choose to close down the question, the pin stays on the map (question list) and the team can return to the task later during the game. 2) Choose the question type: an activity station. Add the instructor password that enables the instructor confirm given points during the whole game. Add maximum points the instructor can give in this location. 3) Add under Comments and clues tab an Intro opening bit what is happening there: “In this location you have to do a team task where each team member must utilize their strength!”. The Intros are displayed when during the game a player taps on the map pin. This helps the team to decide whether they want to visit the location and what is expected from them there. 4) Perhaps change the icon under Additional settings tab to the team icon or another icon you wish, to indicate locations that have the instructor. During the game when the team arrives in the Activity station location, a question/task opens up. Now the team has two options a) perform the task b) close the question screen and return at some other time. 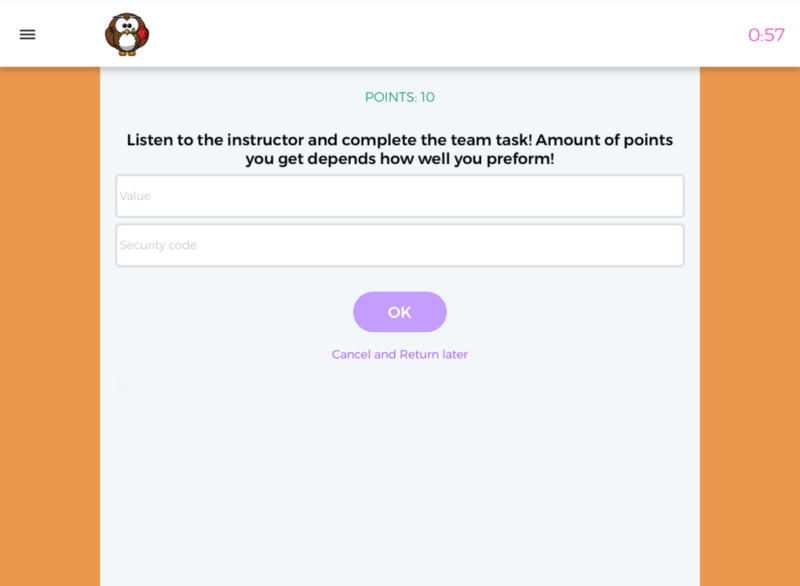 After performing the task the instructor can add points value and then enter the security code and press ok to confirm it. In the following posts we will discuss different types of scoring systems as well some cool activities for instructed locations. Give a superpower as an award to players!